SHERMAN, Texas — Andre Thomas was the type of kid who could memorize entire Bible stories, who would shoot his eager hand in the air before his Sunday school teacher could even finish her question. He wanted to know how everything worked — a “tinkerer,” his dad called him — constantly taking things apart just to figure them out. The fourth of six brothers born to Rochelle Thomas in abject poverty in Sherman, Thomas performed well in school as a young boy despite a difficult home life. Neither Rochelle Thomas, nor his father, Danny Thomas, was around much, so he and his brothers often fended for themselves, spending much of their free time at the Harmony Baptist Church just down the street from their unkempt home, which often lacked electricity. By the time he was in high school, Thomas was a talented artist, sketching intricate drawings of the cars he planned to design one day. His case offers a lens through which to examine the effects of a mental health system in Texas that is too fractured and too underfunded to care for the mentally ill. A system unable to identify and treat the dangerously ill before their affliction affects others. A system that often punishes the deluded instead of helping them to recover and protecting society from them. Thomas’ lawyers argue that his long untreated mental illness not only drove him to commit an unthinkable crime but provoked him to gouge out both of his eyes while behind bars, and has rendered him incompetent for execution. Prosecutors, though, contend that drugs and alcohol and Thomas’ desire for attention fueled his actions. And they say that the jury justly sentenced him to death for them. One of Thomas’ first arrests came at age 11, a charge of criminal mischief for an apartment complex pool escapade. By age 16, he became a father when Andre Lee Boren, known also as Andre Jr., was born. In 2001, on Thomas’ 18th birthday, he married his namesake’s mother, Laura Boren, a petite blonde 17-year-old who had become a doting mother to Andre Jr. despite her youth. Months later, the couple would separate, and Thomas’ illness appeared to worsen. He struggled to hold a job to provide for his son, and he frightened his friends and family with bizarre biblical obsessions. Thomas was drinking and using drugs, cycling in and out of the Grayson County Jail. He attempted suicide, told friends he felt like he was living the same day over and over and spoke of angels and demons whose voices fought in his head. Twice in the three weeks before his terrifying crime, doctors worried that he was dangerous and sought commitment warrants that were never enforced. 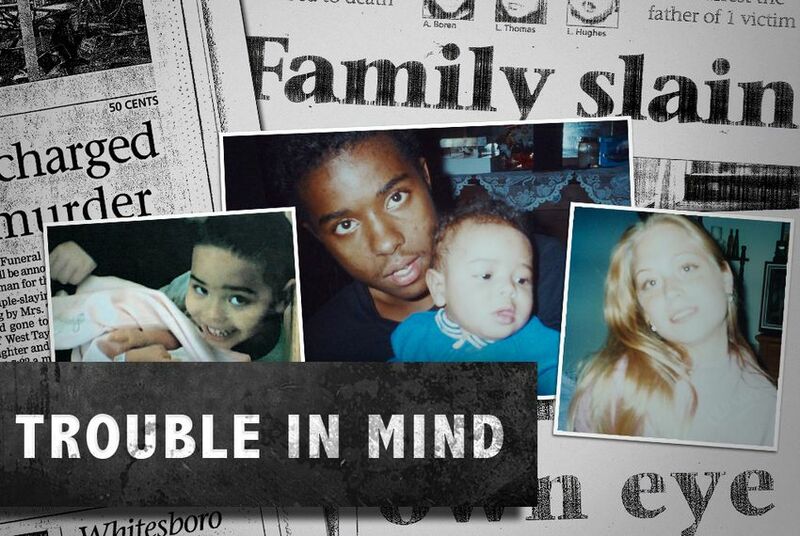 On the morning of March 27, 2004, Laura Boren’s father, Paul Boren, found his daughter with a gaping stab wound in her chest, sprawled across the blood-stained living room carpet in the apartment she shared with her new boyfriend and her children, 4-year-old Andre Jr. and his 1-year-old half-sister, Leyha Hughes. Down the hall, the mutilated bodies of the children lay in their bedroom, surrounded by blood-spattered plastic baby dolls and action figures. Like their mother, the children had massive wounds in their chests, where Thomas later said he had removed their hearts in an attempt to free the demons he said he believed were inside them. Hours later, Thomas, confused and bleeding from self-inflicted stab wounds — he had tried to commit suicide after fatally stabbing Laura Boren and the children — turned himself in to police. He confessed to the murders and asked if he would be forgiven. In the ambulance on the way to the hospital, Thomas told the EMT he didn’t know what was going on. “I just don‘t understand. I just wanted to die to pay for my sins,” he said. The killings stunned Sherman, and news of the crime dominated the front page of the Sherman Herald-Democrat for days. Almost immediately, there were calls for the murderer of the lovely young mother and her children to face the death penalty. While awaiting trial in jail — days after surgeons repaired his bleeding heart — Thomas gouged out his right eye with his bare hand, spurred by Scripture: “If the right eye offends thee, pluck it out.” After a short stay in a state mental hospital, Thomas was deemed competent to stand trial in Sherman. Despite his troubled mental history and self-mutilation, during a trial in which Thomas sat next to his attorneys munching on Skittles, a jury rejected the argument that he was not guilty by reason of insanity. In 2005, at age 22, Thomas was sent to Texas death row in Livingston, where, like the rest of the condemned, he would spend 23 hours a day alone in a 6-by-10 cell. There, Thomas’ mental illness seemed to worsen. On Dec. 9, 2008, Thomas jammed his fingers behind his left eyeball and pulled it from the socket. He ate it whole. In prison, Thomas was diagnosed with schizophrenia. His lawyers appealed to the state’s highest criminal court, arguing that he was no longer a danger to society because of his blindness and that he was ineligible for the death penalty because of his mental state. The Texas Court of Criminal Appeals disagreed, reaching the seemingly conflicting conclusion that, Thomas is “clearly ‘crazy’ but he is also ‘sane’ under Texas law,” because a jury had concluded he knew right from wrong at the time of his crime. Today, Thomas is medicated and living in one of the Texas Department of Criminal Justice’s three psychiatric facilities, the Jester IV unit in Richmond. His eyelids are surgically sewn shut, covering his empty eye sockets. He awaits a ruling from a federal appeals court on a 350-page motion from his attorneys that argues his trial was unfair, marred by a lack of understanding of a mental illness that began manifesting itself as early as age 10, when Thomas first heard voices in his head. His lawyers argue that at trial, the jurors never heard about his family’s history of mental illness. And they say that executing the young man who still has hallucinations would violate the U.S. Constitution’s Eighth Amendment ban on cruel and unusual punishment. Prosecutors, however, argue that Thomas brought on his mental condition with the use of drugs and alcohol. They say he knew what he was doing when he stabbed his wife and ripped out the children's hearts. The removal of his first eye while in jail, they contended at trial, was a result of his sudden withdrawal from the substances he abused. As Thomas’ case languishes, it forces uncomfortable questions about the intersection of the state’s underfunded mental health care system and the Texas criminal justice system. Thomas is one of thousands of mentally ill inmates in Texas prisons. The number of inmates treated for mental illness by the University of Texas Medical Branch, which provides the majority of inmate care in Texas prisons, grew from about 14,500 in August 2008 to nearly 17,900 in August 2012. More than 20 percent of the 290 inmates on Texas death row are diagnosed with some type of mental illness. Systemwide, more than 15 percent of the more than 151,000 TDCJ inmates are diagnosed with some form of mental illness. In the last decade, the U.S. Supreme Court has exempted juveniles and the mentally retarded from execution in landmark cases. Many legal experts and criminal defense lawyers expect that with increasing understanding of the science behind brain disease and behavior, the high court will soon decide whether the mentally ill should join those for whom execution is declared cruel and unusual punishment. It’s not news that the Texas criminal justice system, from juvenile courtrooms to maximum security prisons, is overburdened with delusional and psychotic defendants, a trend that has only grown since the deinstitutionalization of the mentally ill beginning in the 1960s. The idea nationally then was that the mentally ill should get treatment in the community, where they would have the opportunity to live a more normal life. In 1955, there were 500,000 patients in psychiatric hospitals nationwide, said Lynda Frost, director of planning and programs at the University of Texas at Austin’s Hogg Foundation for Mental Health. In 2000, there were 59,000. But funding did not flow from the shuttered hospitals to the community services intended to fill in the gaps. Texas is last nationally in spending on community mental health services. Jails, emergency rooms and homeless shelters have become de facto asylums. State legislators are aware of the burden created by the dearth of mental health resources. In 2011, even while facing a multibillion-dollar budget shortfall, they invested more dollars in state mental health services, at least in part with the hope of reducing costs to the criminal justice system. As they reconvene this spring, though, problems that were decades in the making persist. Community mental health services remain underfunded, but they also are unevenly distributed, with swaths of rural Texas lacking a single psychiatrist. Psychiatric facilities in the Texas prison system are filled to capacity as the TDCJ struggles to keep pace with a growing population of mentally ill inmates. And some argue that the criminal justice procedures should be adjusted to ensure a level playing field for such defendants in the courtroom. And then, there is perhaps the toughest question of all: What should be done with a criminal like Thomas? Tomorrow in the Tribune: Texas has a long and pocked history when it comes to mental health care. From the early days of state-run “lunatic asylums” to the current era of underfunded local mental health services, help for the poor in rural parts Texas is hard to come by.